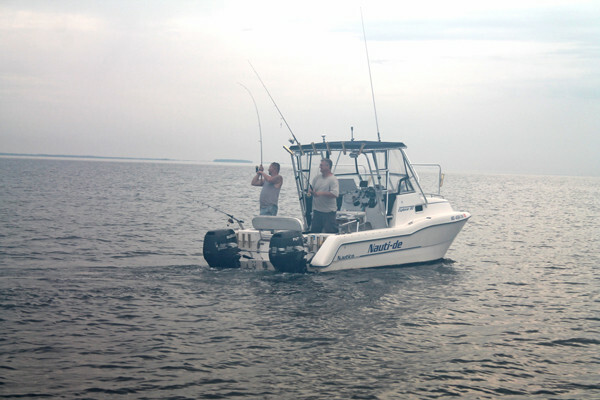 How you rig and run your boat will make a huge difference, when it comes to trolling. Trolling is an effective way to catch fish, but it could be a lot more effective for a lot of anglers. Why? Because it isn’t quite as simple as it seems – how you outfit and run your boat has a huge impact on how successful a troller you are. Use these tips, to troll your way to more fish. 1. Get some specialized rod holders. Take a look at the picture above. Notice the rocket launchers on the top, angled out to the sides? The “side-rigger” rod holder keeping a rod off to the side of the port gunwale? The triple vertical racks on the transom? Having all of these places to pull lines from helps. Having holders that increase the width of your spread helps, too. And notice, just for the record, that these guys have a double hook-up. 2. Always look at lures swimming next to the boat, before deploying them. Far too often, anglers just toss the lure out there and sit the rod in the holder. How do you know that spoon is wiggling right? That the paddle-tail is paddling? You don’t – unless you hold it in the water next to the boat, and watch it swim, first. 3. If you don’t already have them, get a few in-line planers. These will carry your offerings down 10 or 15 feet. No, that won’t matter in some situations, but in some others, the planer lines will make a killing. 4. When you aren’t catching, change speed. A change of a mere half a MPH can sometimes make all the difference in the world, so give the throttles a bump now and again, and see if you start getting more (or fewer) hits. 5. When there’s a current involved, try going in a cross-current direction. Quite regularly, fish will refuse to hit a bait or lure going either with or against the current (more often, with). If you need to troll back and forth over a specific location, that means you’re essentially wasting half your time if you go back and forth into and with the current. But fish will almost always hit a bait or lure going across the current. So if you troll across it, your rods will stay bent.